It was a busy Monday! We were fortunate enough to have beautiful, sunny weather yesterday and today. The children had a fun Sunday with their host families doing various different activities, and despite getting some extra rest, we were all a bit tired today from our active weekend. We started off the day at the "Wagon de l'Armistice" in the "Fôret de Compiègne". We had some trouble finding the entrance when the bus dropped us off, so we took a lovely stroll down the path through the forest and then back after. We had a somewhat shortened visit with our guide because of this, but we still learned many things. This clearing was the place in the Forest of Compiègne where the WWI Armistice was signed. Marechal Foch came in his train car that served as office because the quiet calm of the forest seemed like a more fitting place to sign the treaty that would end one of the greatest wars in history. The Germans joined the French by train on November 8, 1918 and after several days of discussion, the Armistice was signed on November 11, 1918. During WWII, the Germans under Hitler and the French met in the same wagon in the same spot in the Forest of Compiègne to sign a different treaty. This time Marechal Pétain signed a treaty that said that the French would be in agreement with the Germans. Thus began the fight between Vichy France that cooperated with the Germans and the Resistance led by General De Gaulle. Unfortunately, during the bombing of Berlin, the original train car was destroyed, and the one we saw today was a different train car from the same period. We then went to the second part of the building to the museum of the two World Wars. There were photo boxes that had 3D black and white photos from WWI inside them. Each box had a slideshow of photos from a specific area of battle that you could flip through. It was very interesting to see real photos of soldiers, trenches, and the destruction of the war in 3D. The last part of the museum has two rooms each dedicated to one of the World Wars. There were artifacts, newspaper articles, and more photos. After our guided visit, we went to the workshop next door where our guide showed us weapons, helmets, and uniforms from the World Wars. The children were delighted because they actually got to try on the helmets and uniforms and hold the weapons. It was shocking how heavy the guns were. We got some great pictures of the students holding the weapons and trying on the uniforms. It's not often that you actually get to hold and wear the artifacts in a museum. We then hurried to the Château de Compiègne for a guided visit. This château was built by Louis XV and used by the emperors Napoléon I and III. 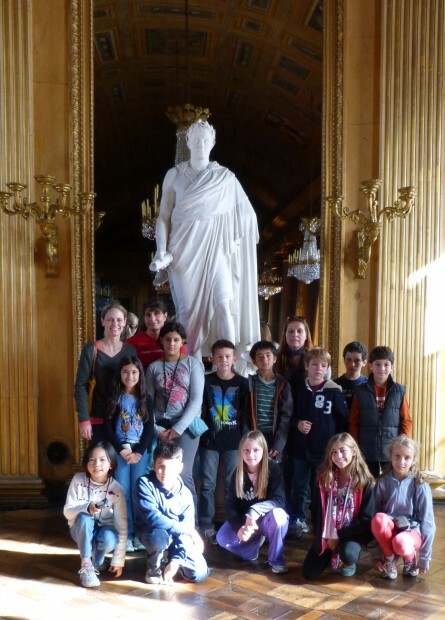 We saw the beautiful decoration in the château, and we were all impressed by the trompe l'oeil paintings on the walls that looked like sculptures. The children took many photos (authorized without flash) throughout the visit. We had a chance to buy some souvenirs in the gift shop at the château before heading off to our picnic lunch. We went to a pond in the Forest of Compiègne in order to have our picnic in the sun. It was so sunny and warm that we were able to wear t-shirts! This is a huge change from last year when we were frozen the whole trip. We came back to Blérancourt after lunch to do "tir à l'arc" or archery in English. 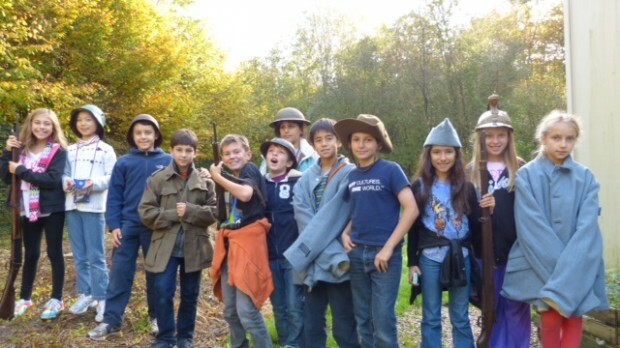 The students learned about the different types of arcs and arrows that one can use for archery. They then separated into groups based on the arc that they would use. Each group had one of the archers from the Club in Blérancourt to help them and teach them how to properly shoot. We had some natural champion archers, and everyone enjoyed himself/herself, especially since the weather continued to be beautiful. Tomorrow we head to Auvers sur Oise to learn about the impressionists and Van Gogh.